This species is accepted, and its native range is W. Central & S. U.S.A. to Tropical America. Perennial; caespitose. Culms geniculately ascending; 100-200 cm long. Leaf-sheaths keeled; smooth, or antrorsely scabrous; outer margin hairy. Ligule a fringe of hairs; 2 mm long. Collar pilose. Leaf-blade base with a brief petiole-like connection to sheath. Leaf-blades flat, or plicate, or conduplicate; 25-50 cm long; 20-30 mm wide. Leaf-blade surface scabrous; rough on both sides. Leaf-blade apex acuminate. Inflorescence a panicle. Peduncle smooth, or antrorsely scabrous above. Panicle spiciform; linear; dense, or loose; tapering above and tapering below; 15-30 cm long; 4-5 cm wide. Primary panicle branches ascending; 2-3 cm long; sterile at the tips. 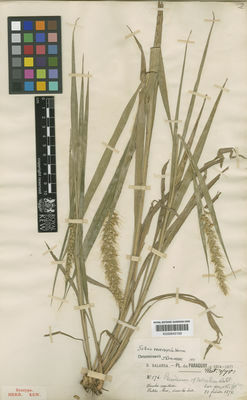 Panicle axis angular; scabrous; pilose. Panicle branches stiff. Spikelets subtended by an involucre. Fertile spikelets pedicelled; 1 in the cluster. Involucre composed of bristles; 20-30 mm long. Involucral bristles persistent; 1-2 per spikelet; flexible; antrorsely scaberulous; glabrous. Pedicels oblong. Spikelets comprising 1 basal sterile florets; 1 fertile florets; without rhachilla extension. Spikelets ovate; dorsally compressed; compressed slightly; 2.5 mm long; falling entire. Glumes shorter than spikelet; thinner than fertile lemma. Lower glume ovate; 0.33-0.5 length of spikelet; membranous; without keels; 3-5 -veined. Lower glume apex acute. Upper glume ovate; 0.33-0.5 length of spikelet; membranous; without keels; 7 -veined. Upper glume apex acute. Basal sterile florets barren; with palea. Lemma of lower sterile floret ovate; 1 length of spikelet; membranous; 5 -veined; acute. Palea of lower sterile floret 1 length of lemma. Fertile lemma ovate; dorsally compressed; gibbous; 2.5 mm long; indurate; yellow; without keel. Lemma surface rugose. Lemma margins involute. Lemma apex acute. Palea involute; indurate. Nativa en Colombia; Alt. 0 - 1000 m.; Amazonia, Andes, Guayana y Serranía de La Macarena, Llanura del Caribe, Orinoquia, Pacífico, Sierra Nevada de Santa Marta, Valle del Magdalena. 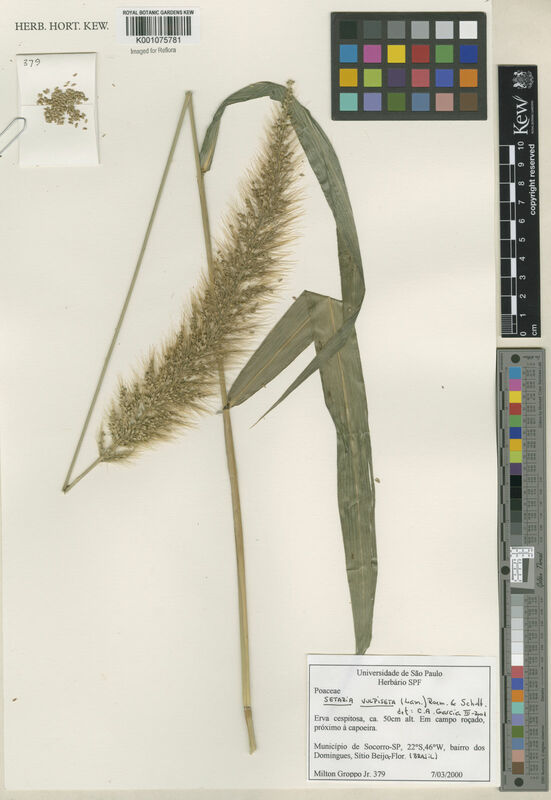 Setaria alopecurus Fisch. ex Trin. Setaria liebmannii f. trichorhachis Hack. Setaria macrostachya Hochst. ex Steud.